Hugh Grant is an English actor and film producer. He has been nominated and won numerous awards including Golden Globe, Kid's Choice, Teen Choice, and British Academy Film awards. The film that arguably launched him into stardom was the 1995 film Four Weddings and a Funeral. Other notable films of his include Notting Hill, Bridget Jones's Diary, and About a Boy. 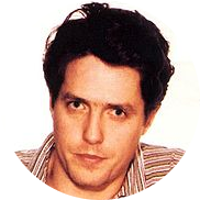 Hugh Grant has numerous family connections to the English royal family including Queen Elizabeth II, Princess Diana, Catherine Middleton, King Henry VIII, and his wives Catherine Parr, Jane Seymour, and Anne Boleyn. His U.S. Presidential kin include, but is not limited to, George Washington, Thomas Jefferson, James Madison, William H. Harrison, Benjamin Harrison, Franklin D. Roosevelt, and Jimmy Carter. Historical figures in Hugh Grant's family tree include Fletcher Christian (H.M.S. Bounty), Charles Darwin (Evolutionist), Lt. Gen. James Brudenell (led the “Charge of the Light Brigade”), and Sir Winston Churchill (British Prime Minister during WWII). Hugh Grant has a number of celebrity kinships including actress Olivia de Havilland and her sister Joan Fountaine, actor Randolph Scott, actress Bette Davis, British filmmaker Guy Ritchie, actress Kyra Sedgwick, and actor Steve McQueen. Literary kin include Harper Lee (To Kill a Mockingbird), Jack London (Call of the Wild), Ray Bradbury (The Martian Chronicles), and Jonathan Swift (Gulliver's Travels).